John Joubert, who was 90 this year, seems to be undergoing something of a revival. His opera Jane Eyre has just received its first recording (see my review), and now this disc from Resonus Classics of Joubert's sacred music from Wells Cathedral Choir. It is all recent, the Missa Wellensis and Locus Iste from 2013 and St Mark Passion from 2015, performed by Peter Auty (tenor), Benjamin Bevan (baritone), Richard May (cello), David Bednall (organ), and Wells Cathedral Choir, conductor Matthew Owens. 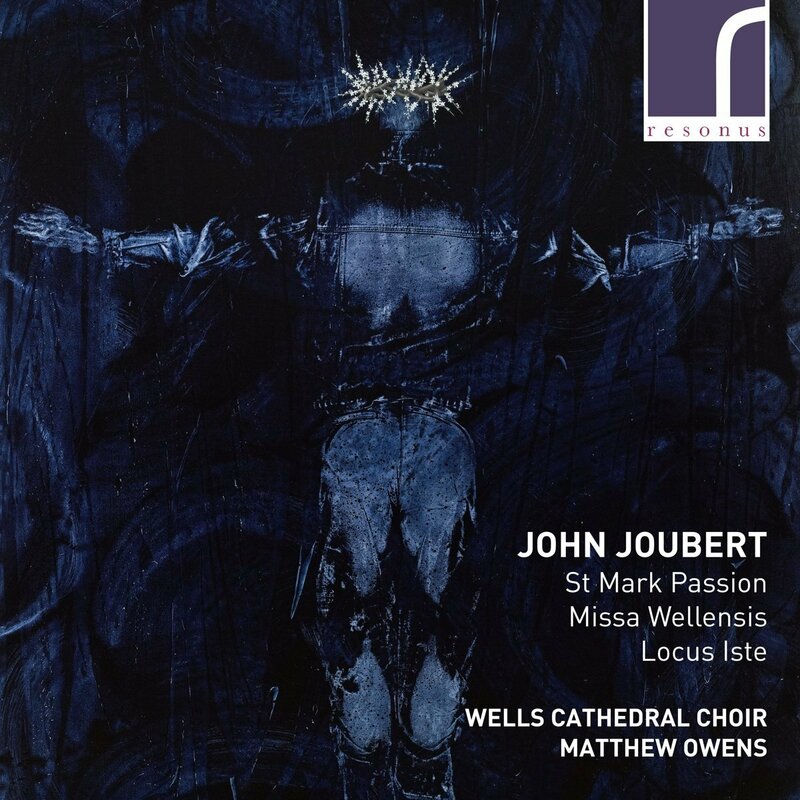 During June 2013, Joubert led a master-class in composition at Wells Cathedral School, and had the Missa Wellensis, Op.174 and Locus Iste Op.175 premiered in the cathedral as part of the festival, new music wells, where he was composer in residence. His relationship with Wells continued, and on Palm Sunday 2016, his 89th birthday, Matthew Owens and the choir gave the premiere of the St Mark Passion in a liturgical context, and repeated the work on Psalm Sunday 2017. The 'Kyrie' of the Missa Wellensis plunges right in, with a strong and distinctive sense of Joubert's voice. The work has rather an austere feel, and the music develops harmonic rather than polyphonic interest, and there is a touching treble solo in the 'Christe'. The 'Gloria' is robust and vigorous, again with some solo contributions to 'Domine Deus'. The 'Sanctus' starts of rich in harmony and rather mystical, but develops into a thrilling 'Dominus Deus', with voices entering one by one in the 'Pleni sunt coeli' leading to a shattering 'Hosanna'. The 'Benedictus' uses solos over held chords, quiet and intense though perhaps the soloists do not quite achieve the rapture intended, and the concluding 'Hosanna' is similarly quiet. The 'Agnus Dei' has an effective and appealing simplicity, building in intensity with each repeat, leading to a final fugue. A complex and striking work. Locus Iste is rather sober and intense with an interesting use of major/minor alternations and a fugal passages which suggest an element of conflict, but all is resolved on a lovely chord at the end. Joubert's St Mark Passion is an intersection of ancient and modern, as Joubert writes the work for narrator (Peter Auty), Jesus (Benjamin Bevan) and chorus, setting text taken from the passion narrative in the gospel, but each section concludes with a hymn, selected from the English Hymnal, which presupposes congregational involvement (a requirement given the work received a liturgical performance). Besides the two leading soloists there are three further, taken by choir members, Judas (Christopher Sheldrake), Pilate (Craig Bissex), Centurion (Ian MacLeod). Another interesting aspect is the use of solo cello (Richard May) to accompany the narrative alongside the organ (David Bednall). It is this use of cello which gives the work a quite distinctive sound-world, and Joubert combines this with a quite significant organ part. The narrative is hardly discreet recitative, it is expressive arioso and Peter Auty as the narrator brings all his operatic experience to bear. Bednall's organ acts more as commentator, intensifying and dramatising elements, so that some of the moments build into significant climaxes. Benjamin Bevan is similarly thrilling as Jesus, his 'This is my blood of the new testament' with a richly complex organ accompaniment, is a notable highpoint. The concluding section is highly dramatic a whilst Bach is clearly in the background, Auty as narrator clearly responds to the more modern, quasi operatic drama of the music, (one thinks of Britten's St Nicholas, with its use of hymns), and the whole builds towards the concluding hymn, 'When I survey the wondrous cross' which develops from unaccompanied treble solo to strong congregation and organ. I am less certain about the hymns, Joubert surrounds them with richly harmonic structure, provided by the organ. I suspect my reaction is more to do with my own uncertain attitude to hymn singing, but for me these passages do not provide the same sort of emotional pull as Bach's chorales and Tippett's spirituals do. In many ways the passion feels like an extended anthem, or perhaps a series of five anthems, in fact the way the work is organised with each section having its own climax and concluding hymn, seems very practical and suggests that individual sections might work on their own. The passion is a long work, and you have to admire the way Wells has invested in the work, performing it in a liturgical context in 2016 and 2017 as well as giving us this recording. It is a wonderful reflection in the commitment to contemporary music, and has given us this striking late work from Joubert's pen.